Whether you are looking to host a small gathering or big banquet, enjoy seamless experiences with a wide range of spaces to choose from as well as a comprehensive range of audio-visual equipment that can be set up according to your needs. Our team of professional planners will always be on-hand to assist you in creating the perfect event. Create your dream wedding at our hotel with a host of spacious wedding venues in Jakarta that will cater to your needs. Indulge in additional touches such as a baby grand piano and fruit fountain, or select from a variety of packages to personalize your perfect setting. Our team of experienced planners at the Sari Pacific Jakarta will help you turn your wedding into an exceptional experience. 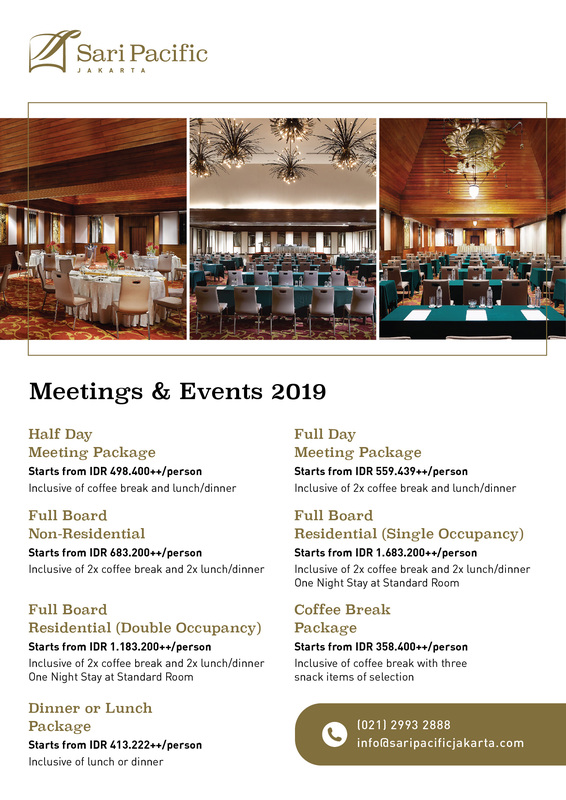 Hold your meeting or conference amidst a modern setting with comprehensive audio-visual equipment at the Grand Istana Ballroom, Sari Pacific Jakarta. Generous in space, it can comfortably accommodate up to 550 guests and features a Wi-Fi access, whiteboard, flip chart, PA system with microphone, projection screen, business stationery, fresh flower arrangements for main table and reception area, phone extension lines for your reception table, Mushola and prayer kit available upon request and other event supplies (podium, place cards, etc.) upon request. Organize the perfect conference or seminar in the Jayakarta Room, a modern venue that comes with a comprehensive range of audio-visual equipment to help provide your guests with a better event experience. It features a Wi-Fi access, whiteboard, flip chart, PA system with microphone, projection screen, business stationery, fresh flower arrangements for main table and reception area, phone extension lines for your reception table, Mushola and prayer kit available upon request and other event supplies (podium, place cards, etc.) upon request. The Mitra Room at Sari Pacific Jakarta is a spacious and comfortable function room that seats up to 40 guests and is just the right size for a business meeting or a mid-sized conference. This room features you a Wi-Fi access, whiteboard, flip chart, PA system with microphone, projection screen, business stationery, fresh flower arrangements for main table and reception area, phone extension lines for your reception table, Mushola and prayer kit available upon request and other event supplies (podium, place cards, etc.) upon request. Set the right tone for your event in this spacious yet intimate venue that can accommodate up to 60 guests. The Jaya Room at Sari Pacific Jakarta is ideal for networking events or business cocktail gatherings and features a Wi-Fi access, whiteboard, flip chart, PA system with microphone, projection screen, business stationery, fresh flower arrangements for main table and reception area, phone extension lines for your reception table, Mushola and prayer kit available upon request and other event supplies (podium, place cards, etc.) upon request. The Private Room offers an intimate setting for smaller meetings, with a range of modern business amenities and seating for up to 20 people along with Wi-Fi access, whiteboard, flip chart, PA system with microphone, projection screen, business stationery, fresh flower arrangements for main table and reception area, phone extension lines for your reception table, Mushola and prayer kit available upon request and other event supplies (podium, place cards, etc.) upon request. The Kencana Room is a spacious venue with a comprehensive range of audio-visual equipment that can accommodate up to 100 guests. It is ideal for small conferences, networking events or intimate business cocktail parties. This room features a Wi-Fi access, whiteboard, flip chart, PA system with microphone, projection screen, business stationery, fresh flower arrangements for main table and reception area, phone extension lines for your reception table, Mushola and prayer kit available upon request and other event supplies (podium, place cards, etc.) upon request. Impress your guests in a grand space that seats up to 400 people at the Istana Ballroom, Sari Pacific Jakarta – the perfect venue for large business gatherings or networking events that features Wi-Fi access, whiteboard, flip chart, PA system with microphone, projection screen, business stationery, fresh flower arrangements for main table and reception area, phone extension lines for your reception table, Mushola and prayer kit available upon request and other event supplies (podium, place cards, etc.) upon request. Enjoy the comfort of a generous yet inviting space that can accommodate up to 200 guests with ease. Our Istana Ballrooms I and II can be customized for small conferences as well as large business gatherings. The rooms are completed with Wi-Fi access, whiteboard, flip chart, PA system with microphone, projection screen, business stationery, fresh flower arrangements for main table and reception area, phone extension lines for your reception table, Mushola and prayer kit available upon request and other event supplies (podium, place cards, etc.) upon request. Perfect for intimate nuptials or receptions of up to 410 guests, let our beautifully landscaped poolside set the stage for your once-in-a-lifetime event and featuring a Wi-Fi access, Audio-visual equipment, Red carpet, Special wedding buffet, Chocolate fondue and Croque en Bouche. From holy matrimonies, solemnisation events, to cocktail receptions and wedding dinners, our poolside area will provide the ideal backdrop for the event you have in mind. Exchange your vows surrounded by refreshing greenery and natural daylight, complemented with romantic decor to make your special day that much more unforgettable.